Westerville-based sculptor Michael Tizzano will visit Auglaize County’s Riverside Art Center, W. Auglaize St., in historic downtown Wapakoneta, from 5 to 7:30 p.m., on March 20. Tizzano is creating a sculpture of Neil Armstrong that will be installed in Wapakoneta’s downtown parkway this summer in commemoration of the 50th anniversary of the Apollo 11 Moon Landing. The event is free and open to the public. Riverside will offer the chance for two persons to win a visit to the foundry in early April to drop off Neil. In addition to the art center visit, Tizzano will present assemblies at Wapakoneta Middle School during the day, Wednesday. 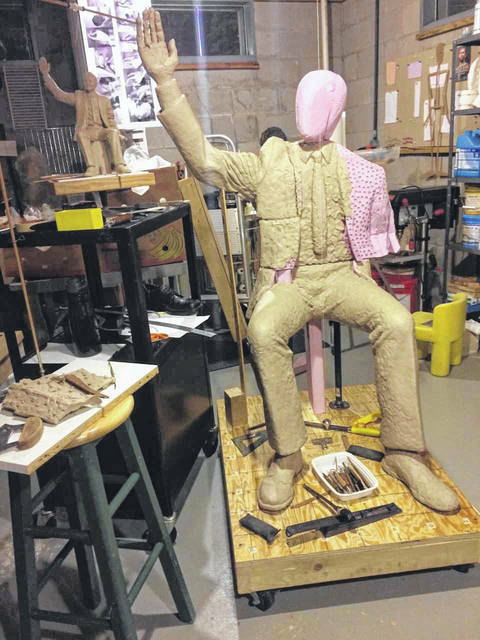 https://www.sidneydailynews.com/wp-content/uploads/sites/47/2019/03/web1_sculpture.jpgWesterville-based sculptor Michael Tizzano will visit Auglaize County’s Riverside Art Center, W. Auglaize St., in historic downtown Wapakoneta, from 5 to 7:30 p.m., on March 20. Tizzano is creating a sculpture of Neil Armstrong that will be installed in Wapakoneta’s downtown parkway this summer in commemoration of the 50th anniversary of the Apollo 11 Moon Landing. The event is free and open to the public. Riverside will offer the chance for two persons to win a visit to the foundry in early April to drop off Neil. In addition to the art center visit, Tizzano will present assemblies at Wapakoneta Middle School during the day, Wednesday. Courtesy photo.